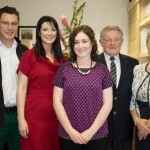 The new GP service / Family Medical Practice at the Lismore Clinic was officially launched last Friday 11th September. The evening was attended by local pharmacists and other local business people, public health nurses, GPs, other healthcare practitioners and family and friends of Dr Noelle Quann. Speaking at the official opening, AnneMarie Reilly, Medical Herbalist and Nutritionist who established the clinic in 2004, welcomed Dr Noelle Quann to the team, saying that patients can now avail of an integrated, multi disciplinary healthcare service at the Lismore Clinic, where they can benefit from both conventional medical care and a variety of complementary and alternative approaches, providing a more comprehensive and holistic approach to healthcare. 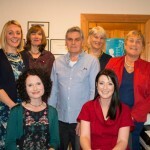 AnneMarie introduced all the members of the team, and explained that in order to provide the highest standards of healthcare, all practitioners at the Lismore Clinic are fully qualified and experienced in their field, and registered with the appropriate professional body. Dr Quann thanked AnneMarie Reilly for having the vision to establish a service with an all encompassing approach to health. “She really takes into account the health and wellbeing, physical and emotional, of every individual and I look forward to working with her”, said Dr Quann. 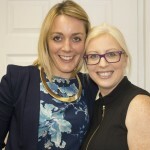 She acknowledged the uniqueness of the Lismore Clinic in bringing conventional and alternative medicines together and their way of looking at the whole person and their physical as well as mental/emotional needs. Very Reverend Father Michael Corkery performend a blessing on the clinic before Aoife Hearne and Dr. Quann cut the ribbon to officially open the new GP surgery. Age-related Macular Degeneration (AMD) is thought to affect one in 10 people over the age of 50 in Ireland and is the leading cause of blindness in this age group. AMD Awareness Week, which runs from Tuesday 15th to Saturday 19th of September, aims to encourage the public, and particularly those over 50, to get their sight tested in order to help prevent avoidable sight loss due to AMD. AMD causes degeneration of the macula of the eye, which is the part of the retina responsible for sharp central vision, and perception of colour and contrast, all of which are important for driving, reading, watching TV, recognising faces and for numerous other daily activities that we often take for granted. AMD spares the peripheral vision, so sufferers can still see things “out of the corner of their eye”, but it leaves only dim images or black holes at the center of the visual field. There are 2 types of AMD, Dry (or atrophic) AMD and Wet (or neovascular) AMD. Dry AMD is the most common form, affecting more than 90% of AMD sufferers. The condition and develops slowly, eventually leading to loss of central vision. Wet AMD is caused by new blood vessels growing behind the retina, which are weak and tend to bleed. It is less common than dry AMD but it can cause more rapid loss of vision, and is responsible for 90% of cases of severe vision loss. Symptoms of AMD include blurred vision; dark patches or empty spaces, which appear in the centre of the visual field; distorted vision, (where straight lines such as tiles in the bathroom or telephone poles may appear wavy or bent); difficulty distinguishing faces; difficulty reading; decreased night vision and poor colour sensitivity. The tendency to develop AMD is genetic, however studies have shown that smokers are twice as likely to develop macular degeneration. Other factors such as high blood pressure can also lead to a greater risk of getting AMD. This is because high blood pressure, like smoking, leads to a constriction, or narrowing, of the blood vessels in the retina. This constriction limits the amount of blood able to circulate and bring blood and oxygen to the retina. Poor diet can also lead to a greater risk of getting AMD due to insufficient nutrients to protect the macula. Unfortunately there is no proven cure for AMD, however, there are a number of nutrients, which can help to reduce the progression of the disease and help to prevent further damage to the vision. Antioxidant nutrients including Lutein, Zeaxanthin, Vitamins C & E, beta-carotene, copper and zinc, help to reduce the risk of developing AMD, and can slow down loss of sight in those who have already developed the condition. Sunflower, pumpkin and sesame seeds are rich in vitamin E and zinc, while orange vegetables such as carrot, pumpkin and squash, dark leafy greens and other colourful fruits and vegetables are rich in beta-carotene, vitamin A and C, minerals, and other antioxidants. Raw kale (which can be added to green smoothies or salads) has the highest content of lutein of any vegetable, and is also rich in zeaxanthin. Bilberry extract (Vaccinium myrtillus) is also rich in antioxidants and is commonly used by herbalists in conjunction with nutritional supplements to treat AMD. AMD can often develop in one eye first with no noticeable effects, as the condition is painless, and the other eye tends to compensate. It is only when the second eye develops symptoms that the problem becomes apparent, and this could be too late to treat the first eye. If left untreated 17% of people will progress to advanced AMD within five years. Therefore, if you are over 50, it is important to have a comprehensive eye check every 2 years to detect early signs of AMD. A mobile testing unit will visit Dublin, Cork, Galway, Limerick and Waterford between Tuesday 15th and Saturday19th of September, offering free AMD eye testing and information to the general public. Free AMD testing will also be available in participating optometrists nationwide during AMD awareness week. For further information on mobile testing dates and venues, and a list of participating optometrists, check out the AMD website at www.amd.ie.